Blood Brothers arrives at the UK’s top theatres for its 2019 tour, presented by prolific producer Bill Kenwright. Starring Linzi Hateley in the iconic role of Mrs Johnstone, the Olivier Award-winning musical features a book, music and lyrics by Willy Russell. After running in London’s West End for 24 years, the award-winning Blood Brothers embarks on a 2019 tour across the UK – from Leeds to Llandudno and Bournemouth to Birmingham. Blood Brothers has seen a variety of revivals across the globe; in the West End, UK tours, Australia, Broadway and even South Africa. Huge stars have featured in the production, and the role of Mrs Johnstone has been played by the likes of Barbara Dickson, Stephanie Lawrence, the Nolan Sisters, Marti Webb, Carole King, and Melanie Chisholm. Seen by millions all over the world, Blood Brothers continues to be one of theatre’s favourite musicals, featuring memorable songs including “Marilyn Monroe”, “Shoes Upon the Table”, “Easy Terms” and “Tell Me It’s Not True”. Blood Brothers is the heart-breaking story of Mickey and Edward, two brothers separated at birth but brought together again through an unlikely friendship. With their familial relationship concealed by their parents, who have striven to keep them apart because of superstitious beliefs, the pair find themselves irreversibly intertwined. Despite relocating, their lives continue to be tangled, although the deep divisions between Edward’s privileged life and Mickey’s poverty-stricken existence begin to be a burden. As they try to conquer social divisions, their friendship is damaged and they are forced to deal with the harsh realities of class consciousness, with Edward leaving to attend Oxford, whilst Mickey spirals into a life of crime. As adults, the brothers are caught in a vicious love triangle with Mickey’s childhood sweetheart, Linda. When Mickey is imprisoned, Linda’s subsequent depression forces her into the arms of a conciliatory Edward. A desperate Mickey decides to take action against his fraternal twin, which ultimately exposes their true identities. You must have seen the wrong play.I’ve seen it 5 times,and will be going again when it comes to Coventryor Birmingham!! One of the Great British musicals – hence it’s long run here and Broadway success. What an amazing musical, I was gripped from start to finish.. Very upsetting that it will not be showing any longer at phoenix, I hope they change their mind and bring it back! Bob obviously watched something else. I saw Blood Brothers over 100 times, mostly at The Phoenix in the West End, and in many other parts of the country, including The Sunderland Empire. When I went, Mrs Johnstone was always LYN PAUL, and she was brilliant in the role. That`s why Bill Kenwright chose her, out of all the women who have ever led the cast, LYN PAUL is the undisputed definitive “Mrs J” of all time. I first saw Linda Nolan as “Mrs J”……such a powerful voice from a tiny lady,and to recover from cancer is amazing. OMFG. Best thing Ive ever seen live. Blood Brothers was one of the best shows that I have seen. It was great and so moving such a great story. It was the best show i ever seen in London. Can’t wait to see it again. Saw blood brother when it came to cheltenham a few years ago with school – LOVED IT. Took my boyfriend, mum and her partner to see it last week as it came back to cheltenham again, still amazing and I cannot even describe how fantastic the cast were! Maureen Nolan made an amazing Mrs J and the boys playing Sammy, Eddie and Mickey could not have been cast better! 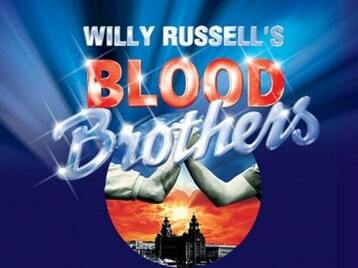 I went to watch Blood Brothers for the first time in the Sheffield theatre last month. I can honestly say it was the best show I have ever seen! I cried, laughed, even winced slightly at the gun shots. Definitely worth watching! we are currntly doing this in drama at uni it is a very good play bit of a sad one, i hope yopu all like it cause their will never be on e shown ever again,GOODLUCKGUYSSS! Can’t believe the tour is closing!!!!!!!! MUST MUST MUST come out on DVD?!? PLEASE PLEASE PLEASE – maybe a recording of the last night of the tour??? best musical ever! Les Mis is currently sold out courtesy of the film, and the same was shown for Phantom and Mamma Mia – BRING OUT A FILM! A great show. A good story,songs and simple sets can be just as effective and enjoyable as the big lavish productions. I would like to see it again. This play is what got my love affair with theatre started as a young boy. A truely fantastic musical/play that brought tears and laughter. You’d have to be mad to not like it!! Left me feeling as if I had been a part of the story. I was mesmorised from beginning to the end!